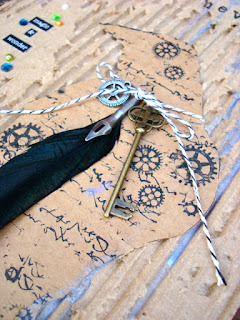 Today’s the start of the blog hop between Faber-Castell Design Memory Craft and 100 Proof Press! We’re very excited for our first collaboration with them! Hop with us today for a blog hop packed with inspiration and techniques! I'm going to share my project with you! I created a piece of mixed media artwork using a piece of 12 x12" cardboard. First I traced a crow shape on the cardboard. I stamped the Japanese Script stamp and Four Gears from 100 Proof Press using the Stamper's Big Brush pen in black. I also stamped the 100 Proof Press Favorite Feather stamp twice using Stamper's Big Brush Pen in Black again. I used a craft knife to cut around the images just through the top layer of the cardboard. I peeled away the top layer to reveal the texture corragated part. In the top left corner, I stamped the Flock of Crows, Single Crow, and Church Window. 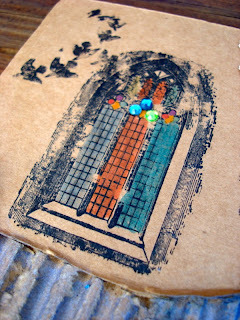 I colored in the window with Stamper's Big Brush Pens in several colors and added bling in the center. 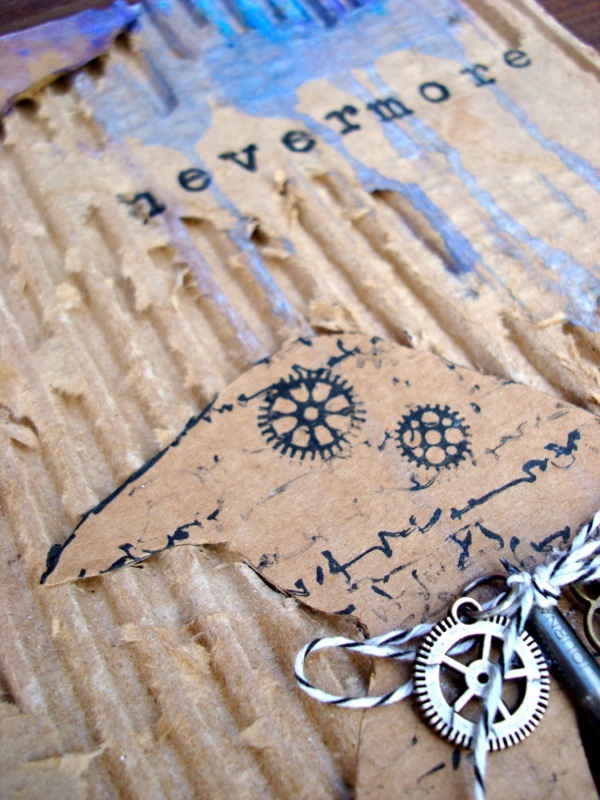 A doily with gears (from Prima) were added for interest. The top right corner was colored with Design Memory Craft Gelatos® in Metallic Blueberry and Metallic Grape. I added water and let it drip. 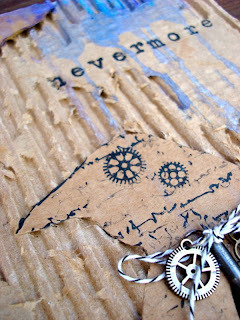 I stamped the word "Nevermore" with the Prima Press and Stamper's Big Brush pen. I also poked holes on either side of the crow and treaded some twine through. I tied a gear, key and Tim Holtz pen nib with a crow feather glued to it. 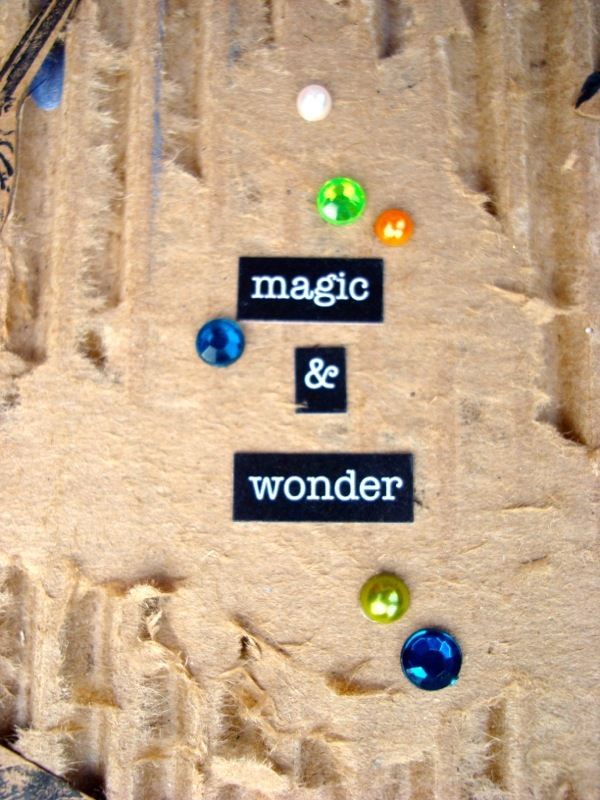 I added a few words and bling to finish it off! I hope you enjoyed my artwork! I LOVED working with 100 Proof Press stamps! They are so awesome! The selection of images is huge and unique... Make sure you check out their site! Want an extra chance to win some prizes? Tweet Design Memory Craft at @DesignMemCraft about a technique you learned on the hop for a chance to win their NEW Stamper’s Big White Pen! Or "like" 100 Proof Press’s Facebook page for a chance to win the calendar you saw on this hop! The blog hop will be open until midnight on October 26th, and the winners will be announced on October 29th on Faber-Castell’s blog/twitter. Your next stop will be at Tracy Evans's blog. Thanks for visiting my blog! Jen Matott: <---------YOU ARE HERE! Very creative--I like the feathers. 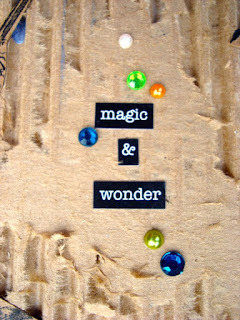 I love your use of the stamps and how you stamped and then peeled away the cardboard - brilliant! I also just bought my 1st two gelatos, so was very interested to see how you used them. Great inspiration here! What a neat piece! 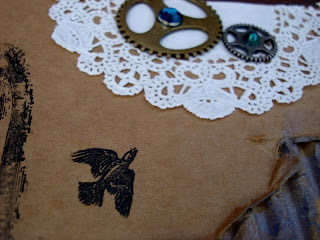 Loving all the textures and how you incorporated stamping! this is totally FAB!! Love it! Wow this is so fantastic! I particularly like the way you peeled back the top layer of cardboard to show the corrugated part below. Love all the texture. Fabulous Piece! Great piece! 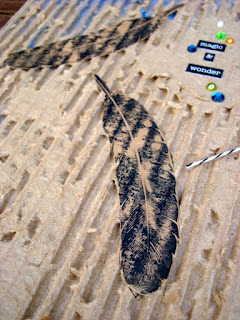 I love how you peeled away the cardboard, great texture. So many wonderful additions on this project. Love it! 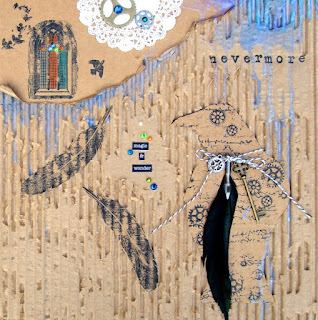 I really love the texture you incorporated into you piece and the blues you added. Very unique way to use cardboard. I live mixed media. It looks like you were inspired by Tim Holtz. Nice look!! WOW love the textures especially the use of the corrugated cardboard! I love all the texture. I'm glad I found your blog through the blog hop.